In the South of France on the Cote d’Azur is a small town called Antibes. In May, in the warm pink evenings, the heady fragrance of Night Blooming Jasmine is carried on the breeze with the scent of the aquamarine Mediterranean Sea. The combination is almost too lovely to bear. Off the coast of Maui in the town of Wailea, the ocean water is so unimaginably blue that snorkeling can feel like an underwater scene from "The Little Mermaid." In Cancun, swimming alongside dolphins in the blue sea is literally a spiritual experience. I am a water baby. I am. As a reporter I have traveled almost a million miles interviewing celebrities around the world. It sounds exciting, doesn't it? But in reality I have spent thousands of hours navigating airports, answering email in taxis as we jerked along in city traffic and sitting in hallways waiting for my interview slot. Typically on trips I would see the airport, a screening in a dark theatre, the interview suites then back to the airport. Sometimes I would forget what city I was in. 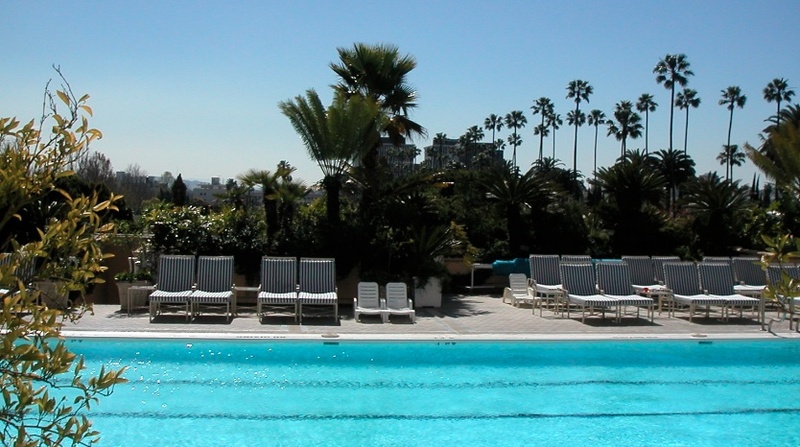 However, whenever I could I would take a swim. 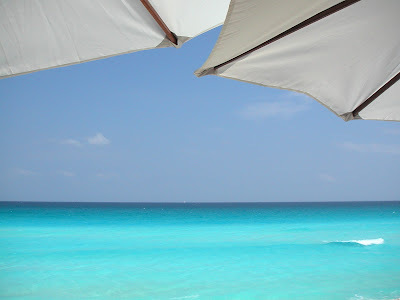 When I am in the water diving under the aquamarine frothy waves watching the bubbles rise poppity pop pop to the surface or sliding into a hotel pool for a quick morning swim as the sun rises above palm trees I am at home. Cutting the surface of the water with the sun warm on my face is when I am happiest. In that moment, I had an epiphany. It will be OK. It was OK. The wonderful moments I had in the past will always be there. I will always be able to close my eyes, smell jasmine on a balmy night and I will be back in the South of France. Whatever wonderful things that happened in the past were still there. I was lucky that I got to experience the things I did. For a girl who grew up poor in a trailer park, being able to even visit a place like Antibes or Wailea, I knew I was lucky. In that moment I appreciated everything I was able to do. Just because something is over doesn’t mean you are lost. What it means is that you were lucky enough to experience wonder or love or contentment with a job or a person. Yes, the epiphany was from looking at a vase. I called the florist. I was over the moon for this vase. They told me it was a glassybaby votive holder. I looked glassybaby up online. I read about Lee Rhodes, the extraordinary creator of glassybaby (Entrepreneur's Magazine's 20011 Entrepreneur of the Year) and her extraordinary story of starting her company after surviving cancer. I read that glassybaby gives a good percentage of profits to charities (over $900,000 so far). I needed to be part of something this good. I found that the studio and store were located in Seattle. I decided to go see where my little glassybaby came from. Walking into the store is a sensory experience. You can see the glassblowers making each glassybaby by hand. Watch them. Their focus and passion is evident when you hold a glassybaby in your hands. That artisan's passion transfers to the glass. It does. The day I was there, there were several dogbeds lined up along the wall in the studio with dogs curled up watching their people work (yes, it is safe for them). The store is simple. White with dozens and dozens of colorful glassybabys. The candles flickering in glassybabys lit up the store. Looking at the colors you think “That cobalt blue (lady di) is exactly the color of my Nana’s waterglass she kept on a table beside her rocking chair.” “That brown is exactly the color of George's coat!” (and interestingly enough it is called wet dog!) There are ballet pinks (tutu), innocent whites (grateful), vibrant reds (happiness), vibrant greens (verdant). Walking around the store I picked up the aquamarine, held it cupped in my hands and up to to the light. There were also dolphin, seaglass and ocean, all the colors of the sea. I looked around and I saw the same grin that I realized was on my face, on others in the store as they held up glassybabys in purple, orange, olive, red, grey and yellow. That day I bought dolphin and grateful. When I got home I put dolphin, grateful and aquamarine together. I lit the candles in the votives, dimmed the lights and I told L. that they represented us, our family, L, me and our dog Emma. And thus started my love affair with glassybaby. I am not alone in my love for glassybaby. Collectors are passionate about their favorite colors. They will stand in line in the rain for hours at the glassybaby Seconds Sale (January and June). glassybaby fans use their glassybabys for candlelight but they also get creative, using them for ice cream sundaes and for flower arrangements. Here, at the Happygirl studio we have glassybabys all around the office. 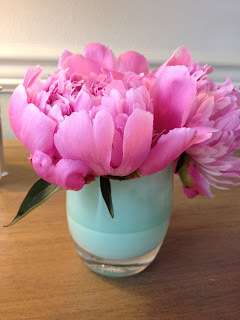 This week we found peonies at the market and made bouquets for our desks. As I write this I am looking at my very first glassybaby that sits here on my desk, never far from me. Right now it is filled with peonies. Later this week it may hold a tealight. Maybe someday it will hold a little Cheerios necklace that my daughter makes for me. Maybe that’s what makes glassybabys so special. They hold dreams. The Aquamarine glassybaby is our signature gift here at The Happygirl. 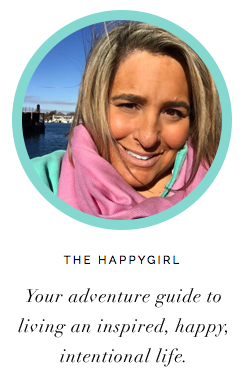 In fact, we liked the color so much it inspired the happygirl logo! We send glassybabys as thank you gifts, shower gifts (wedding and baby!) and as "We love you! You are a true happygirl/happyguy" gifts. We really love them! If you purchase your own Aquamarine glassybaby, 10% of the proceeds of this color goes to the Marsha Riven Center for Ovarian Cancer Research. We love that. 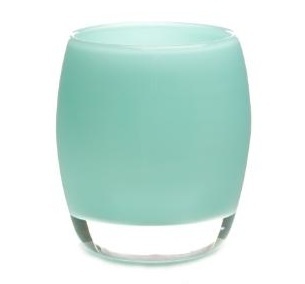 And because we love the Aquamarine glassybaby so very much, we’d like to give one away to a happygirl or happyguy! Leave us a comment before June 16th, 2012. Tell us your favorite color glassybaby, or what your glassybaby means to you. We’d like to hear what you think. One winner will be chosen at random on June 17th and announced here.